In what has now become a tradition, Soulive are currently taking over Brooklyn Bowl for a series of shows filled with special guests and blow-the-doors-off playing. Billed as “Bowlive III”, these shows highlight the band’s efforts to move forward with a jazz/funk genre that all too often seems content to rest on its laurels. This show, for example, had almost nothing in common with the final night of Bowlive II that we covered last year. While that show seemed to emphasize the soul elements of the band, this performance made the guitar skills of the band’s virtuosic regular Eric Krasno its focus. 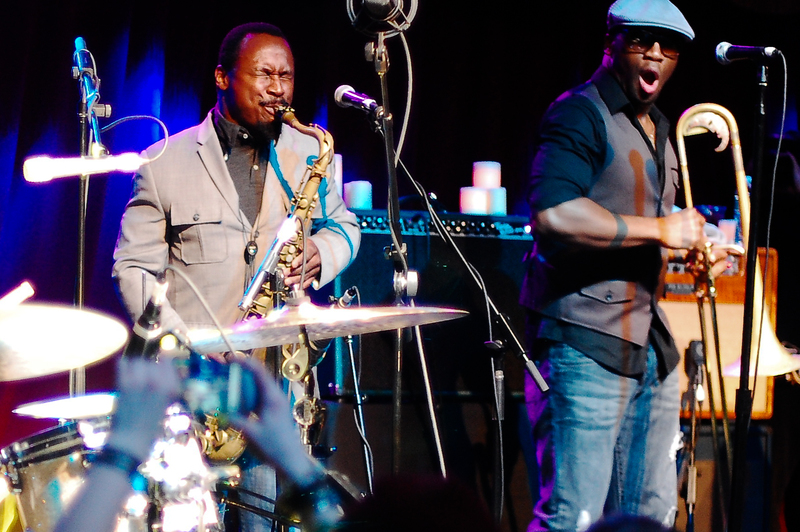 The show opened with several extended numbers with just the trio before the band was joined by a rotating cast that included Karl Denson, regular guest Nigel Hall, and Sam Williams of Big Sam’s Funky Nation. While the guests added some range to the band’s sound, for this set, it was the trio numbers like “Aladdin” that kicked it off that I appreciated most – reminders that even with all the hoopla of the guests at these shows, this is one incredible band on its own. After about 75 minutes of inspired playing, the band took a break during an appearance by special guest Rahzel, who gave a 25-minute beatbox performance that challenged the limits of the physically possible with his ability to essentially play, and sing, an entire song using only his mouth. He joined the band for “I Am the Magnificent” before exiting the stage. The crowd, already partying like madmen, was fully loaded for what was to come. The band’s most recent recorded output is a record of Beatles covers called Rubber Soulive that highlights the shared heritage of jazz and rock n’ roll, so it came as no surprise when the band performed a mini-Beatles set of “Come Together,” “Eleanor Rigby” and “I Want You (She’s So Heavy)”. While the heavily-covered “Come Together” (you may have heard the Aerosmith version) was probably the biggest crowd-pleaser, I was most impressed with the extended jamming on “Eleanor Rigby”, which turned that two-minute gem of a vocal performance into an extended guitar meditation. Rather than being a real “cover” version, the original was merely a starting point for what followed. 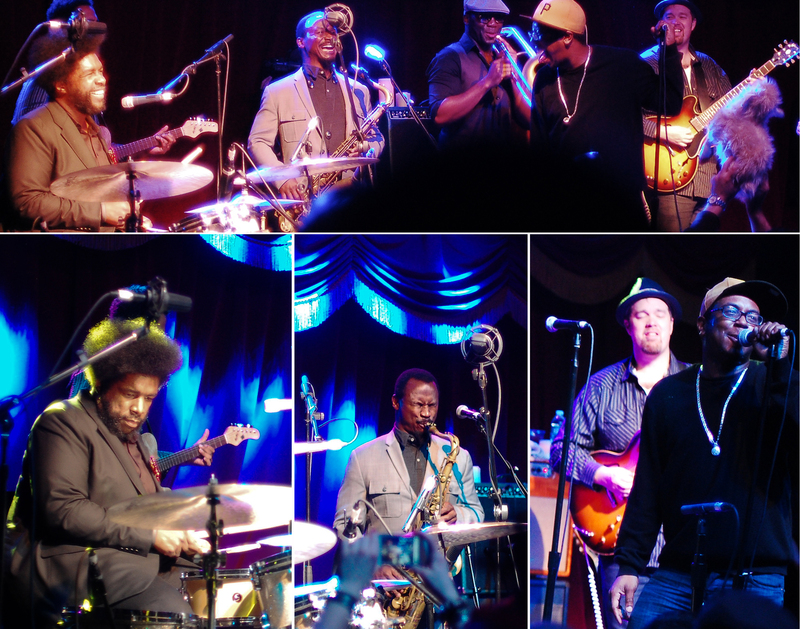 “Too Much”, one of few repeats from the show we saw last year, came next, before Brooklyn Bowl regular Questlove took the stage with Hall, Williams and Lenesha Randolph for a series of songs, including Stevie Wonder’s “Signed, Sealed, Delivered”. With four more Bowlive shows on the way next week (Tuesday, Wednesday, Thursday and Friday), Soulive are sure to have more tricks up their sleeves. Don’t miss out. Thanks to the Brooklyn Bowl staff for their hospitality to us at this show, and to the band for continuing to allow fan audio taping. hi and lo and I recorded this set with Schoeps MK21 wide cardiod microphones onstage, combined with Schoeps MK22 open cardiod microphones on the left side near one of the speakers to pick up some vocals and room ambiance. The result is an incredible recording that truly feels like you are watching the band from the stage lip – which is an amazing experience. There may be some tracking errors here and there – feel free to send corrections. If you download this recording from NYCTaper, we expect that you will PLEASE SUPPORT Soulive, visit their website, and purchase their official releases and merchandise directly from the band’s online store [HERE]. You can also stream these shows live on iClips [HERE]. It’s also not too late to get tickets to the last four nights from Brooklyn Bowl.